You've probably invested hundreds of hours planning every aspect of your wedding, right down to the type of silverware that is going to be used for the place settings at the reception dinner. So, if you can go to this much effort, why on earth would you want to use standard tags, when you can let the experts here at Wedding Sparklers Outlet help you create custom wedding sparkler tags that match your wedding and create beautiful mementos. If you are like most brides or grooms for that matter, you probably agonized over the color for your wedding. While most brides wear white, everything else can be pretty much any color you can imagine. If you are going to go to all that trouble finding the perfect color for your wedding, why would you use plain tags? Here at Wedding Sparklers Outlet, we offer you a choice of ten different colors for your wedding sparklers tags. Like all of our wedding supplies, we believe in choice. The more choice we can offer you, the more likely it will be that we have just what you need. The colors we have chosen were carefully picked to complement virtually any color imaginable and add that extra "personal" touch to your special day. Once you've decided on a color, the next step is to choose whether you want your tags to say, "Let Sparks Fly" or "Let Love Sparkle." These sayings are printed in bold black ink and leave plenty of room for you to add the bride and groom's names and wedding date to the bottom. Rather than one or the other, why not order some with one saying and some with the other. Place a tag over one of our wedding sparklers and then place one next to each seat at the reception dinner tables. Your guests will be thrilled to have a personalized keepsake they can add to their scrapbooks. 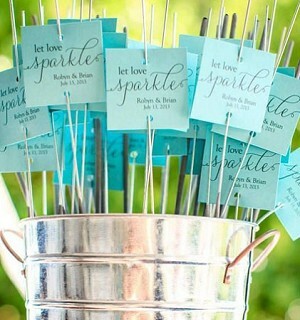 To make sure everyone gets at least one, you can place sparkler display buckets filled with tagged sparklers in convenient spots in the reception all. Our tags already have the necessary holes punched in them. Once you've decided which of the different tags you are going to buy, you can use up to twenty characters for the bride and groom's name. You can also use up to twenty characters for the wedding date and time. You can choose between 98-lb shimmer cardstock or Kraft paper for the tags themselves. We ship our wedding sparkler tags in 24-count boxes and typically ship them along with any other wedding supplies you have ordered within three to four days after we receive your order. Here at Wedding Sparklers Outlet, we offer a full selection of wedding supplies including 10, 20, and 36-inch wedding sparklers, heart-shaped wedding sparklers, sparkler display buckets, and confetti cannons. Our sparklers burn virtually smoke free, making them safe for indoor use and a great way to add a touch of magic to your wedding photos.